Family Dogs and growing babies....life, lessons and love! : Having mixed feelings? There are many mixed emotions along with questions that Moms esepcially experience as they get closer to their due date. "How will I have time for my furry baby?" "Will they understand I still love them?" "Will they be mad at me?" "What if they dislike the baby?" 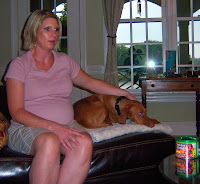 These are all very common questions and anxieties that creep into the minds of Moms and families with dogs as they are anticipating the arrival of their baby. The good news is with preparation, education about dog behavior and specific planning families report back with wonderful success! This is a new chapter of your life together and it is going to include great new things for you pooch too! More love, more fun, and more opportunities for yummy treats!